This account of the the Blazer Mill fight is written by Mr. Almer N. Blazer, whose father owned the mill, and he himself was an eye-witness being in his teens at the time, writes from that perspective. He gives a version that is slightly at variance with Mr. Frank Coe's tale in other particulars and says that the single shot that hit Roberts came from the gun of Billy the Kid, and in this he quotes Billy, who came that way in charge of two deputies on the way from Mesilla to Lincoln after he had been convicted and sentenced for the murder of sheriff Brady of Lincoln county. A TRIP TO NEW MEXICO. 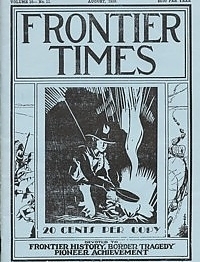 The editor of Frontier Times, in company with Dean T. U. Taylor and J. D. Dillingham of Austin, made a trip to New Mexico the early part of July, to dig up history concerning John Simpson Chisum, the great cattle baron, who entered the cattle business in Denton county, Texas, before the Civil War, and who later moved his herds to Concho county, and operated a store at Trickman, in Coleman county. When the country became too crowded John Chisum again moved his cattle, this time driving them across the Pecos up into New Mexico, and located a ranch there, becoming the greatest cattle baron in the West. The Lincoln county war, and the Billy the Kid history clusters around that early day cattle venture of John S. Chisum, but he was not a participant. This history has been touched upon in various issues of Frontier Times, but more will follow later. Account is a travelogue given by Dean T. U. Taylor at the Bandera County Old Settlers Jubilee at Frontier Times Museum in Bandera, June 3, 1939, under the title of "A One-Day Trip Over the Old Chisholm Trail." Includes map of the old cattle trail. Account of a true Texas hero and patriot, he was one of the Mier Prisoners and a prisoner in Perote Castle. Following his return to Texas, he served as the first sheriff of Victoria county, from 1847 to 1852 in that office. After annexation Captain Thurmond served as a member of the Second Legislature. Here is his story. A GOOD MAN PASSES AWAY. Brief obit. and account of Governor Will H. Mayes, aged 78, former lieutenant-governor, and dean of the University of Texas school of journalism. Written by Z. N. Morrell, in 1871. This is a serial article of 10 installments that traces the events in the life of fiery Baptist frontier preacher, Z. N. Morrell, who came to Texas from Tennessee in December, 1835 due to health problems. His life quickly became intertwined with many formative events in Texas history of which he played an important part. Morrell, besides being a notable preacher of the Gospel and a true Texas patriot, was also an excellent historian and writer. Account of killing of Camilla Hanks, a member of the notorious Butch Cassidy gang, by Colonel Thos. M. Stell, of Cuero, who knew Hanks personally. Lengthy and detailed article comparing the gun-fighters of the day (1930's) versus the renown outlaws of old. Speed comparisons are given in detail. Account of Mrs, Cede Pool Faris, one of Llano county's best known pioneer characters and a member of one of the first families to settle in the county. Her parents, Isaac Sampson and Sarah Hails, came from South Carolina to Texas, and after residing for a time in Lavaca and Williamson counties, they came to Llano and settled in the Long Mountain section. This was in 1853, several years before Llano county was organized. Mrs Faris was born at their Long Mountain home on September 30, 1858. She was married on January 18, 1887, to W. J. Faris, an early day trail driver and ranchman, whose parents, Mr. and Mrs. Solomon Faris, also settled in the Long Mountain section in the early fifties. Here is the story of the Llano pioneer couple. There are still old timers at Colettoville. nine miles west of Victoria, who remember when there wasn't a Colettoville, but a little settlement that was known for miles around as the Steiner Settlement or String Town. Talk to these old timers and they'll tell you of days when it was kind of hard to make a living; times when it wasn't safe if you had any money; and maybe too they will tell you of Frank Winkler. They didn't know Winkler so well but their fathers knew him, and they remember that he was killed by a bunch of "onary men that weren't fit to live." They'll tell of Winkler because he seems to typify what frequently happened in the little town. Here is the story. Account is an oration delivered before the Battle of Flowers Association, in April, 1939, by J. C. Schoultz, A. and M. College of Texas. Account of what became an essential commercil point in Texas, Red River Station connected with great cattle industries that had just sprung into life. Word passed from county to county that a half-breed Indian Jesse Chisholm, had marked a trail through Indian territory; and herds headed for the Red River. It was learned that the Chisholm Trail had extended within sixty miles of the Red River, and the cattlemen soon concentrated on the most strategic point to the south end of the Chisholm Trail. This proved to be at Red River Station, at the mouth of Salt Creek in Montague county. Here is the story. Florence Fenley And "Old Timers"
Brief account of the life of Florence Fenley, who had an eventful life, filled with tragedies, joys and sorrows that would read like fiction. She has actually lived through stirring events in her personal life that would have discouraged a person of less determination She was born December 19, 1898 in her grandfather's home at Uvalde, Texas. She was also married in this same historic home. She was the daughter of Jim Fenley and the granddaughter of Joel C. Fenley.